Napoleon Bonaparte was crowned Emperor of the French on December 2, 1804 at Notre Dame Cathedral in Paris. A victorious general who had become leader of France through a coup d’état, Napoleon wanted to establish the legitimacy of his regime. He also needed to show – in the wake of plots against his life – that even if he was killed, his dynasty would live on. Making his rule hereditary would reassure those who had acquired land and other benefits from the French Revolution that their gains were secure. 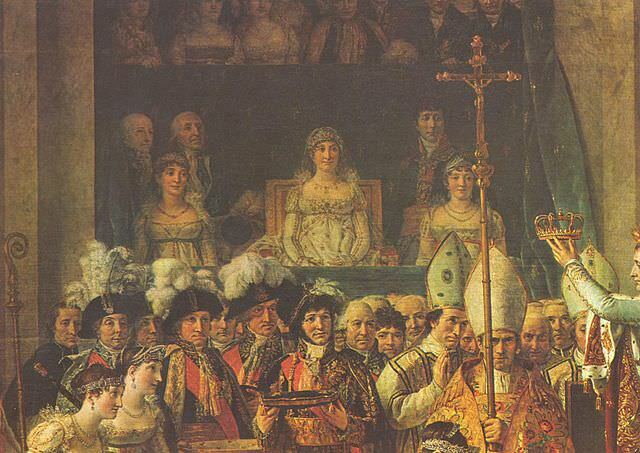 On May 18, 1804, Napoleon’s hand-picked Senate proclaimed him the hereditary “Emperor of the French.” A national plebiscite was held to confirm this change in status. The doctored results – announced on November 6 – showed 3.6 million people (99.93%) in favour and 2,569 against. Half of the potential voters abstained. By this time, preparations for a lavish coronation were well underway. Napoleon, however, ran into a few problems. French monarchs claimed to rule by divine right. The most important part of the traditional French coronation ceremony was the consecration (sacre), or anointing of the king with holy oil, performed by the archbishop of Reims in his cathedral. Aware of the symbolic value of associating his rule with divine providence, Napoleon invited the Pope to officiate at his coronation. Pius VII was wary of Napoleon and reluctant to go to France in the absence of some concessions for the Catholic church, which had been decimated during the French Revolution. Napoleon begged, threatened and bargained, using his uncle Cardinal Joseph Fesch as an intermediary. The Pope finally agreed. The Bonaparte family disliked Napoleon’s wife Josephine and objected to her being crowned Empress. No French queen had been honoured with such a ceremony for centuries. When Napoleon told his sisters Elisa, Pauline and Caroline that he expected them to carry Josephine’s massive velvet train in the coronation ceremony, they made a scene and refused. Napoleon’s brother Joseph sided with his sisters and protested to Napoleon on their behalf. Napoleon was furious and threatened them all with loss of titles and wealth. The sisters fell into line. But they sulked during the ceremony and at one point may have pulled back on the train, preventing Josephine from moving forward (see below). Instead of remaining in Paris for the coronation, Napoleon’s mother Letizia headed off to Rome to be with Napoleon’s brother Lucien, whom Napoleon had exiled for marrying against his wishes. In addition to pointedly supporting Lucien in that dispute, Letizia was also showing her dislike for the imperial title Napoleon had bestowed upon her (Madame Mère). 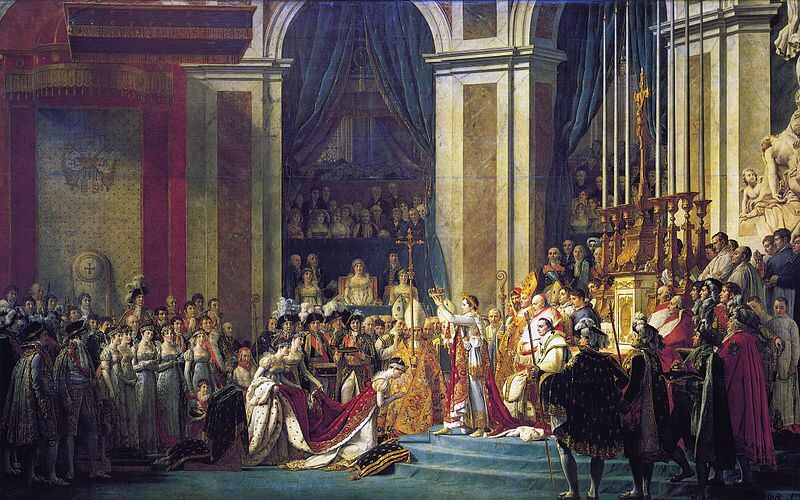 Napoleon instructed Jacques-Louis David to put Letizia in his painting of the coronation anyhow. Sunday, December 2, 1804, was a cold and wintry day. It snowed through the night and continued to snow until 8 a.m. Workers were quickly found to shovel the snow and lay sand along the procession route. The sun reportedly came out from behind the clouds just as Napoleon’s coach arrived at Notre Dame, which the Emperor took as a good omen. Though detachments of six battalions of Grenadiers and Chasseurs of the Guard took up their positions at the cathedral at 5:00 a.m., no one showed up to organize the large crowd that had formed. At 7:00 the senators set out for Notre Dame. At 8:00, members of the Legislative Body, the State Council, the Tribunate and Court of Appeals headed for the church. At 9:00, it was the turn of the diplomatic corps, which included James Monroe, but no representatives from Great Britain, Russia or Austria. Also at 9:00, the Pope began his ride to the church, escorted by four squadrons of dragoons and followed by six carriages full of cardinals and assorted clergy. Then came the secular carriages, led by Marshal Joachim Murat, military governor of Paris and husband of Napoleon’s sister Caroline. At 10:00 Napoleon and Josephine left the Tuileries Palace, accompanied by artillery salvos. Security was tight, with troops three rows deep on either side of the street, amounting to some 80,000 men. There were several delays along the route, as they had not counted on “the confusion that would be caused by the immense size of the processions, shut in between hedges of foot-soldiers, delayed by the eagerness of the populace, and checked by certain petty accidents.” (3) It wasn’t until 11:45 that Napoleon was ready to enter the church. The grand coronation procession of Napoleone the 1st, Emperor of France, from the Church of Notre-Dame, Decr. 2d. 1804. Caricature by James Gillray showing Napoleon’s coronation procession, starting with Louis Bonaparte and Pauline, Hortense (Josephine’s daughter & wife of Louis) and Julie (Joseph’s wife), followed by Talleyrand and his wife, and a dejected Pope Pius VII. Napoleon and Josephine are in the centre. Napoleon’s train is supported by Spain, Prussia and Holland. Pius VII began the mass. He anointed Napoleon’s head, arms and hands in accordance with the ancient tradition. Napoleon then took the crown and put it on his own head. This was not spontaneous gesture, or a snub of the Pope. It had been planned and discussed with the pontiff at great length. Napoleon also crowned Josephine, who began to cry. They then proceeded up some steps to the throne. After the mass, the civilian authorities administered the imperial oath. Shortly before 3:00, the imperial party began the return to the Tuileries, arriving there after dark. Napoleon dined alone with Josephine. The police estimated that some 2 million people were present in Paris. Hundreds of church bells rang out, followed by illuminations, fireworks, formal balls, and dancing in the streets. These and other festivities continued for the next two weeks. The cost of the whole affair was 8.5 million francs, paid for by crown and state treasuries. Napoleon insisted on keeping his title of Emperor of the French even after his abdication and exile to St. Helena. He retains it in Napoleon in America. Frédéric Masson, Napoleon and His Coronation, translated by Frederic Cobb (Philadelphia, 1911), pp. 219-220. Laure Junot Abrantès, Memoirs of Napoleon, his Court and Family, Vol. II (London, 1836), p. 53. Napoleon and His Coronation, p. 227. Pius VII anointed Napoleon’s head, arms and hands in accordance with the ancient tradition. But then Napoleon took the crown and put it on his own head!!! Even if the self-crowning had been planned and discussed with the pontiff before hand, it must have left the poor old pope gobsmacked. He must have wondered why he bothered making the long and exhausting trip from Rome. I imagine there were a number of things the Pope didn’t like about the coronation, not least of which was the fact Napoleon didn’t follow through on his vague assurances of religious concessions. As historian Pieter Geyl wrote, “The Pope would never have left Rome merely to perform a consecration.” Something Pius VII had plenty of time to reflect on when he was later imprisoned by the Emperor! The fact that the pope was relegated to a second place role was QUITE OBVIOUSLY a matter of POLICY!! It was to indicate to EVERYONE that, henceforth, the state was laicised in ALL MATTERS and that therefore,the civil ruler was not, in future, to be subject to any regulations set forth by the Catholic Church. It was NOT meant to be an insult to the Pope, it was a political act! In all of the procedures during the Popes visit to France, the Pope was given second place. An extension of Gallicanism, strengthened by the Revolution that preceded the Napoleonic Era. As such, it was a demonstration of the civil State, not to be interfered with by any religious Institution. Historically logical,it was a new principle which, of course, displeased the other rulers of Europe, who were still hooked on medieval attitudes concerning the Papacy, particularly in Austria. The restoration took a step backward in some of these issues, but was never again able to restore completely the old status of the Catholic Church. Napoleon, by the way, did restore the Catholic faith to France in the Concordat of 1801, which abolished the religious schism that had divided believers in France during the Revolution. And thus created a long-lasting religious peace in France for the next 100 years, when it was replaced by a new Concordat in 1905. The Pope fully acknowledged that and declared it to have been “a courageous act” on the part of Napoleon. Thanks, Irene. There’s a good article by Peter Hicks on Napoleon.org about the relationship between Napoleon and the Pope: http://www.napoleon.org/en/history-of-the-two-empires/articles/napoleon-and-the-pope-from-the-concordat-to-the-excommunication/. Lovely blog Shannon, I love the headings. Napoleon is such an interesting character! Great read! Thanks, Paula. I’m glad you enjoyed it. Nice article. Yes, on paintings and prints it always looks so grand and dynamic, an event you really would like to attend, but I think those who were actually present would tell you: “you rather than me”. A lot of people caught a cold in the chilly cathedral. I was looking at the caricature. I thought the figure with the shako with the skull and bones on it was Russia and the figure was supposed to resemble a Cossack. Thanks, Pim. I agree, the fellow does look like a Cossack. According to the detailed description of the caricature on the British Museum website, it’s actually a Prussian hussar. Thanks for the detailed article! I particularly love the part about how the audience entered early and the masters of ceremony were still in bed – so typical for all the improvisation that was going on during Napoleon’s rule. It’s not on the same scale but I believe there were more minor incidents during the coronation. Didn’t Hortense also mention a ring in her memoirs that Josephine lost? Glad you enjoyed the article, Josefa. You’re right about the ring. In her memoirs, Hortense wrote: “As she entered the church, my mother mislaid the ring given her by the Pope which he was to bless. His superstitious nature might have seen in this incident a sign of coming misfortune. My brother found the ring afterwards and gave it to me.” I imagine that was a heart-stopping moment, at least for Josephine, who was already nervous. The onlookers were cold and hungry, although some tradesmen had slipped into the church with rolls and sausages. No one saw anything of the ceremony . . . .